Objectives: The purpose of this study was to investigate the physiological and psychological effects of massage on delayed onset muscle soreness (DOMS). Methods: Eighteen volunteers were randomly assigned to either a massage or control group. DOMS was induced with six sets of eight maximal eccentric contractions of the right hamstring, which were followed 2 h later by 20 min of massage or sham massage (control). Peak torque and mood were assessed at 2, 6, 24, and 48 h postexercise. Range of motion (ROM) and intensity and unpleasantness of soreness were assessed at 6, 24, and 48 h postexercise. Neutrophil count was assessed at 6 and 24 h postexercise. Results: A two factor ANOVA (treatment v time) with repeated measures on the second factor showed no significant treatment differences for peak torque, ROM, neutrophils, unpleasantness of soreness, and mood (p > 0.05). 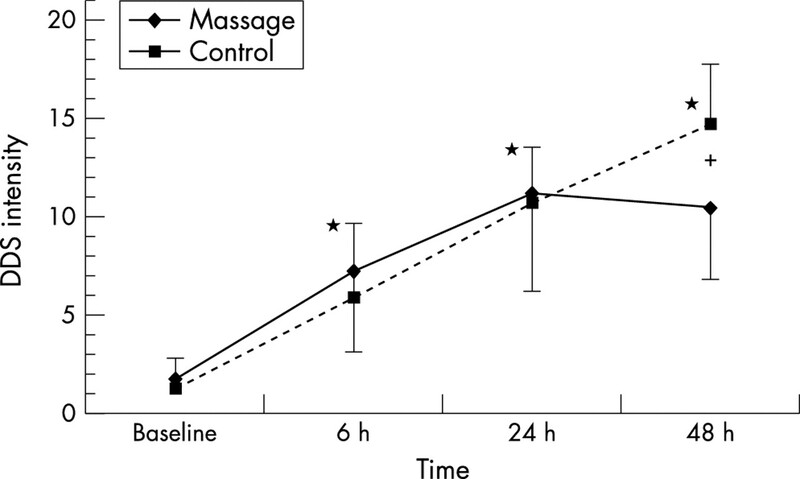 The intensity of soreness, however, was significantly lower in the massage group relative to the control group at 48 h postexercise (p < 0.05). Conclusions: Massage administered 2 h after exercise induced muscle injury did not improve hamstring function but did reduce the intensity of soreness 48 h after muscle insult. Researchers also report that massage enhances perception of recovery after boxing performances,27 and improves mood, as measured by a Profile of Mood States (POMS).28 To date, researchers have not examined the possible relationship among massage, mood perceptions, and DOMS. Hence, our secondary purpose was to make a broader assessment of the psychological effects of massage on DOMS by using both the POMS and DDS analyses. Eighteen male and female volunteers, with a mean (SD) for age and weight of 20.4 (1.0) years and 72.6 (14.1) kg respectively. None of the subjects were pregnant, participating in a competitive sport, recovering from a knee injury, taking anti-inflammatory medication, or weight training the hamstrings in the four months preceding the study. All subjects signed an informed consent document and the Ithaca College Review Board for Human Subjects Research approved this project. After the ROM determination, subjects were familiarised with the isokinetic device (Cybex Norm, Version 2.01, Henly Healthcare, USA) that was used to measure peak torque and induce muscle soreness. Immediately after this familiarisation period, the subjects completed eight submaximal and two maximal eccentric contractions with the right hamstrings (0–70° of extension) at a slow velocity (30°/s) as a warm up for the baseline peak torque measurements. Subjects resisted the eccentric movement of the lever arm and observed visual feedback of torque to encourage maximal effort. After 2 min of rest, they completed five maximal eccentric contractions with the right hamstrings. The highest value obtained during these lifts was recorded as peak torque and served as the baseline value for the study. After the peak torque determination, subjects completed the DDS, which contains two sets of 12 descriptor items that measure both the intensity and unpleasantness of soreness.26 As previously stated, the DDS descriptors are randomly arranged for each session and located above a line with 21 points for the subjects to mark. Scores for the respective descriptor sets were summed and averaged to obtain mean scores for intensity and unpleasantness of muscle soreness, which served as baseline values for this study. After completing the DDS, a 5 ml blood sample was taken by venipuncture from each subject. Differential slides were created, dried, and stained for 7 min with a Hematek 100 (Miles and Company, USA). A trained technician counted 100 cells and recorded the percentage of neutrophils. This count was the baseline measure for this study. Subjects were randomly assigned to one of two groups: massage intervention (n = 9) or control (n = 9) after the first lab visit. The experimental treatment for each subject began at 8:00 am on the scheduled day and started with the previously described isokinetic warm up protocol. Afterwards, six sets of 10 maximal eccentric contractions with the right hamstring were completed to induce muscle damage; there was 1 min of rest between sets. Next, each subject completed five more maximal eccentric contractions. Peak torque was recorded from these additional lifts and labelled as 0 h postexercise. The subjects returned at 2 h postexercise and peak torque was again measured as previously described. Next, the subjects received 20 min of massage or control treatment depending on their group assignment. The muscle massage consisted of classical Swedish techniques, which are preferred by most physiotherapists,31 and included: five minutes of effleurage (stroking), one minute of tapotement (percussion), 12 minutes of petrissage (kneading), and two additional minutes of effleurage.31,32 A senior physical therapy student, whose time on each stroke was standardised by an audiotape, performed the massage. The control treatment consisted of a placebo lotion that was applied to the control subjects‘ legs by the masseuse, who then instructed these subjects to rest for 20 min while listening to the same audiotape heard by the massage group. Subjects in both groups were told that their treatment might reduce inflammation. After the treatment, subjects completed a POMS questionnaire. At 6 and 24 h postexercise, subjects returned to the lab so that mood state, ROM, peak torque, soreness, and neutrophil levels could be measured. Final data collection without neutrophil assessment occurred at 48 h postexercise. A two factor ANOVA (treatment × time) with repeated measures on the second factor was used for each dependent variable: peak torque, ROM, DDS intensity and unpleasantness of soreness, neutrophil levels, and POMS score. A Tukey posthoc test was used when a significant time effect was observed, whereas a Bonferroni posthoc test was used when a significant interaction was observed. Statistical significance was set at p < 0.05 for all tests. Table 1 shows the values for hamstring peak torque and ROM. A main time effect for torque (F (5,80) = 24.63, p < 0.000) and ROM (F (3,48) = 20.28, p < 0.000), but no treatment effect or interaction. Tukey posthoc analyses showed that both groups had a significant decrease in strength at each postexercise time, whereas ROM decreased significantly in both groups at 24 and 48 h postexercise. Since there was a significant baseline difference in the neutrophil data (p < 0.05), a two factor ANCOVA (treatment × time) was used to analyse them. The analysis indicated that there were no significant differences across time or between groups for this variable. The adjusted means (SD) for neutrophils per 100 leukocytes in the massage group at 6 h and 24 h were 61.5 (4.6) and 57.5 (3.3), respectively. The corresponding values for the control group were 54.1 (4.6) and 50.2 (3.3). The baseline prior to adjustment was 58.5. Figures 1 and 2 show the DDS intensity and unpleasantness data. There was a significant interaction (F (3,45) = 3.02, p < 0.05) and main time effect (F (3,45) = 45.57, p < 0.05) in the intensity data. Bonferroni posthoc analyses showed that both groups had significantly higher intensities of soreness at 6, 24, and 48 h postexercise; the analyses also indicated that the control group‘s soreness was more intense than the massage group‘s at 48 h postexercise (figure 1). The only significant finding in the unpleasantness data was for time (F (3,42) = 34.12, p < 0.05). A Tukey posthoc analysis indicated that both groups had higher feelings of unpleasantness at 24 and 48 h postexercise (figure 2). Figure 3 shows the POMS data. There was a main time effect (F (4,56) = 3.144, p < 0.05), but no treatment effect or interaction. A Tukey posthoc test revealed that mood disturbance in both groups was significantly greater at 24 h postexercise than at baseline. Differential Descriptor Scale intensity of soreness in massage and control subjects. Data are presented as means (SD), and higher scores represent greater intensities of soreness. Both groups indicated significantly higher (* = p ≤ 0.000) intensities of soreness at 6, 24, and 48 h postexercise compared to baseline. Also, the control group reported significantly greater (+ = p ≤ 0.000) intensity of soreness at 48 h postexercise compared to the massage group. Differential Descriptor Scale unpleasantness of soreness in massage and control subjects. Data are presented as means (SD), and higher scores represent greater perceptions of unpleasantness. Both groups indicated significant increases (* = p ≤ 0.000) in unpleasantness at 24 h and 48 h postexercise compared to baseline. Profile of Mood States (POMS) scores in massage and control subjects. Data are presented as means (SD), and higher scores represent greater mood disturbances. Both groups indicated significantly higher (* = p < 0.000) POMS scores at 24 h postexercise compared to baseline. Our primary purpose was to assess the physiological effects of massage on DOMS. We found that massage rendered 2 h after strenuous eccentric exercise did not alter the circulating neutrophil count, peak torque, or ROM. Our finding that massage did not alter the neutrophil count was robust, as our power for this analysis was equal to 1.0. These data suggest that massage did not affect neutrophil margination, a finding that contrasts with data from Smith et al.17 One possible explanation for this discrepancy in the data is the quantity of muscle mass injured, as we studied a larger muscle mass than the previous study.17 Induced injury to a larger muscle mass could initiate a greater inflammatory response, possible making it more difficult to discern a treatment effect on neutrophil margination. The duration of the work bout used to induce DOMS also varied between the studies. Our subjects completed 60 maximal eccentric repetitions, compared to only 35 in the early work. The greater duration of exercise in our study may have induced more muscle damage, a hypothesis that could be supported by muscle function data. The earlier study, however, did not measure changes in muscle function, which prevents such a comparison. Based on the current theory for DOMS,1–3,20,21 the inability of massage to alter circulating neutrophil levels suggests that muscle damage induced by inflammation would not be attenuated. Indeed, we found that massage did not alter muscle function between the groups, which provides additional evidence that neutrophil margination was unaltered. Our ability to draw strong conclusions from the muscle function data is limited because of large variability, but these findings are consistent with peak torque measurements in other studies.20,21 Power analyses revealed that given the variability in our data, we would have needed a sample size greater than 55 to achieve a power = 0.8. Although massage rendered after muscle injury did not alter any physiological variables, it did lower the intensity of soreness after 48 h.
Massage administered after DOMS inducing exercise did not alter neutrophil levels or hamstring function. Massage, however, did lower the intensity of soreness. The mechanism for the difference in soreness intensity remains to be elucidated. We would like to thank Joseph Murray for the massage treatments and the Ithaca College Physical Therapy Department. Also, we are greatly indebted to Janet Wigglesworth, whose statistical analyses and advice were instrumental to this project. Armstrong RB. Mechanisms of exercise-induced delayed onset muscular soreness: a brief review. Med Sci Sports Exerc1984;16:529–38. MacIntyre DL, Reid WD, McKenzie DC. Delayed onset muscle soreness: the inflammatory response to muscle injury and its clinical implications. Sports Med1995;20:24–40. Powers SK, Howley ET. Exercise physiology: theory and application to fitness and performance. 3rd ed. Baltimore, MD: Williams & Waverly, 1996. Smith LL. Acute inflammation: the underlying mechanisms in delayed onset muscle soreness? Med Sci Sports Exerc1991;23:542–51. Child RB, Saxton JM, Donnelly AE. Comparison of eccentric knee extensors muscle actions at two muscle lengths on indices of damage and angle-specific force production in humans. J Sports Sci1998;16:301–8. Newman DJ, Jones DA, Ghosh G, et al. Muscle fatigue and pain after eccentric contractions at long and short muscle lengths. Clin Sci1988;74:553–7. Belcastro AN. Skeletal muscle calcium-activated neutral protease (calpain) with exercise. J Appl Physiol1993;74:1381–6. Belcastro AN, Shewchuk LD, Raj DA. Exercise-induced muscle injury: a calpain hypothesis. Mol Cell Biochem1998;179:135–45. Faulkner JA, Brooks SV, Opiteck JA. Injury to skeletal muscle fibers during contractions: conditions of occurrences and prevention. Phys Ther1993;73:911–21. Weiss SJ. Tissue destruction by neutrophils. N Engl J Med1989;320:365–76. Edwards SW. Biochemistry and physiology of the neutrophil. New York: Cambridge University Press, 1994. O‘Conner PJ, Cook DB. Exercise and pain: the neurobiology, measurement, and laboratory study of pain in relation to exercise in humans. Exerc Sport Sci Rev1999;27:119–66. Bougie JD. Management of delayed onset muscle soreness: a review of literature. Sports Chiropractic and Rehabilitation1997;11:1–10. Gulick DT, Kimura IF, Sitler M, et al. Various treatment techniques on signs and symptoms of delayed onset muscle soreness. Journal of Athletic Training1996;31:145–52. 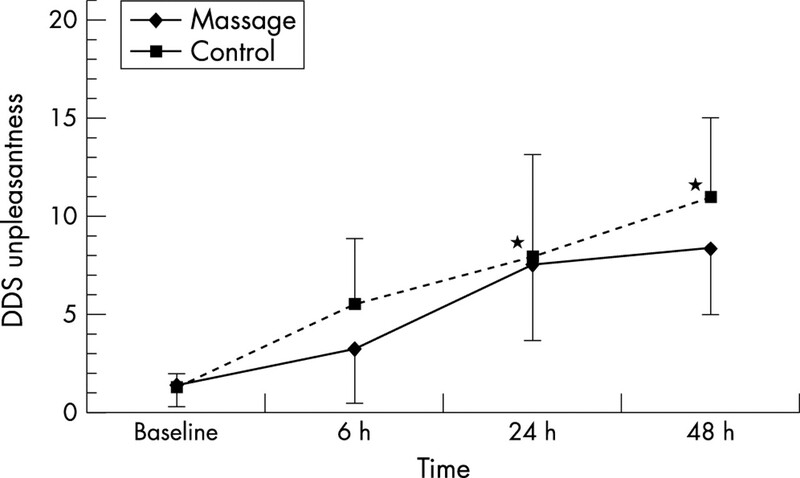 Ernst E. Does post-exercise massage treatment reduce delayed onset muscle soreness? A systematic review. Br J Sports Med1998;32:212–14. Smith LL, Keating MN, Holbert D, et al. The effects of athletic massage on delayed onset muscle soreness, creatine kinase, and neutrophil count: a preliminary report. Journal of Orthopedic and Sport Physical Therapy1994;19:93–9. Tiidus PM. Massage and ultrasound as therapeutic modalities in exercise-induced muscle damage. Can J Appl Physiol1999;24:267–78. Warren GL, Lowe DA, Armstrong RB. Measurement tools used in the study of eccentric contraction-induced injury. Sports Med1999;27:43–59. MacIntyre DL, Reid WD, Lyster DM, et al. Presence of WBC, decreased strength, and delayed soreness in muscle after eccentric exercise. J Appl Physiol1996;80:1006–13. MacIntyre DL, Reid WD, Lyster DM, et al. Different effects of strenuous eccentric exercise on the accumulation of neutrophils in muscle in women and men. Eur J Appl Physiol2000;81:47–53. Cafarelli E, Sim J, Carolan B, et al. Vibratory massage and short-term recovery from muscular fatigue. Int J Sports Med1990;11:474–8. Rodenburg JB, Steenbeck P, Shiereck P, et al. Warm-up, stretching, and massage diminish the harmful effects of eccentric exercise. Int J Sports Med1994;15:414–19. Shoemaker JK, Tiidus PM, Mader R. Failure of manual massage to alter limb blood flow: measure by Doppler ultrasound. Medicine and Science in Sport and Exercise1997;29:610–14. Viitasalo JT, Niemela K, Kaappola R, et al. Warm underwater water-jet massage improves recovery from intense physical exercise. Eur J Appl Physiol1995;71:431–8. Gracely RH, Kwilosz DM. The Descriptor Differential Scale: applying psychophysical principles to clinical assessment. Pain1988;35:279–88. Hemmings B, Smith M, Graydon J, et al. Effects of massage on physiological restoration, perceived recovery, and repeated sports performance. Br J Sports Med2000;34:109–15. Weinberg AJ, Kolodny K. The relationship of massage and exercise to mood enhancement. The Sport Psychologist1988;2:202–11. Mcnair DM, Lorr ML, Droppleman LF. EITS manual for the Profile of Mood States. San Diego, CA, USA: Educational and Industrial Testing Service, 1981. Gerhardt J. Documentation of joint movement. 3rd ed. Portland, OR, USA: Isomed, 1992. Callaghan MJ. The role of massage in the management of the athlete: a review. Br J Sports Med1993;27:28–33. Cafarelli E, Flint F. The role of massage in preparation for and recovery from exercise: an overview. Sports Med1992;14:1–9. Pyne DP. Regulation of neutrophil function during exercise. Sports Med1994;17:245–58. Croisier JL, Camus G, Deby-Dupont G, et al. Myocellular enzyme leakage, polymorphonuclear neutrophil activation and delayed onset muscle soreness induced by isokinetic eccentric exercise. Arch Physiol Biochem1996;104:322–29. Field T. Massage therapy effects. Am Psychol1998;53:1270–81. Sterne JAC, Smith GD. Sifting the evidence—what‘s wrong with significance tests? Phys Ther2001;81:1464–9. Goldfarb AH, Jamurtas AZ. Beta endorphin response to exercise: an update. Sports Med1997;24:8–16.